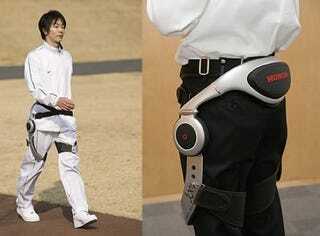 Honda has developed a gadget that they say could make walking easier for the elderly and others with weak leg muscles. The aptly named Walking Assist Device is a 6 lb. motorized belt with hip sensors that gauge how much help the wearer will need. The motor then gives the wearer an appropriate boost, lengthening his or her stride enough to make walking easier on the legs. Honda began research of a walking assist device in 1999 with a goal to provide more people with the joy of mobility. Currently, the device has entered into the feasibility stage. The cooperative control technology utilized for this device is a unique Honda innovation achieved through the cumulative study of human walking just as the research and development of technologies was conducted for Honda's advanced humanoid robot, ASIMO. Applying cooperative control based on the information obtained from hip angle sensors, the motors provide optimal assistance based on a command from the control CPU. With this assist, the user's stride will be lengthened compared to the user's normal stride without the device and therefore the ease of walking is achieved. The compact design of the device was achieved with flat brushless motors and a control system developed by Honda. In addition, a simple design to be worn with a belt around the hip and thigh was employed to help achieve overall weight as light as approximately 2.8kg. As a result, the device reduces the user's load and can be fit to different body shapes. The research of this device is being conducted by the Fundamental Technology Research Center of Honda R&D Co., Ltd. in Wako, Saitama. Honda is planning to offer interested attendees an opportunity to wear and experience this walking assist device at the Honda booth at BARRIER FREE 2008. (*) This device is designed for people who are still capable of walking on their own.